Cruz Azul (pronounced [kɾus aˈsul]) is a Mexican football club that plays in the top division of Mexican football, Liga MX. Cruz Azul has been the Primera División champion eight times, trailing Toluca's 10, C.D. Guadalajara's 12 and Club América's 13. Cruz Azul's six titles makes it the second most successful club in the history of the CONCACAF Champions League, the most prestigious international club competition in North American football, trailing Mexico City rivals, Club America. Cruz Azul was also the first CONCACAF team to reach the final of the Copa Libertadores, the most prestigious club competition in South American football (which invited top Liga MX clubs from 1998 to 2017), losing on penalties to Argentine football giants Boca Juniors in 2001. In the 1968–69 season, Cruz Azul became the first CONCACAF club (and third worldwide club) to complete a rare Continental Treble, winning the Mexican Primera División championship, the Copa México national tournament, and the CONCACAF Champions League. The International Federation of Football History & Statistics, in its Club World Ranking for year ending December 31, 2014, places Cruz Azul as the 99th best club in the world and the 3rd best club in CONCACAF. According to several polls published, Cruz Azul is the third most popular team in Mexico, behind only C.D. Guadalajara and Club América. Cruz Azul was founded under the name of Club Deportivo Cruz Azul as an amateur team on 22 March 1927. The founders were the workers of cement maker Cemento Cruz Azul; the team played in the town of Jasso (now part of the "city cooperative" Ciudad Cooperativa Cruz Azul) in the state of Hidalgo. Cemento Cruz Azul was the only official sponsor until 1997, and remains a primary sponsor through present day. Guillermo Álvarez Marcia and Carlos Garcés were the main force behind the effort to organize the club, and the quick success of the team led to frequently representing the state of Hidalgo in national amateur tournaments. From 1927 to 1960, the amateur team played many times in Mexico City against the reserve squads of established professional teams such as América, Necaxa, Atlante F.C., Asturias F.C. and Club Deportivo Marte. Cemento Cruz Azul changed its name to "Cooperativa Cruz Azul", and in 1960 the consistent success of the team caused the new administration of the cement company to build the Estadio 10 de Diciembre in Jasso. The team entered professional competition in the Segunda División de México for the 1960–61 season. Hungarian coach Jorge Marik guided the team to the Segunda División championship for the 1963–64 season, elevating them to the Primera División the following season. That season ended with an eighth-place finish. Four years later, Cruz Azul won its first Primera División league tournament, under coach Raúl Cárdenas. Between 1970–1980, Cruz Azul led the Primera División with six league tournament championships; four under Cárdenas and the last two under Ignacio Trelles. This powerful version of the team earned the nickname La Máquina Celeste (The Blue Machine), which continues as one of the unofficial nicknames of the team. The team earned its eighth and most recent championship in 1997 under coach Luis Fernando Tena, beating León 2–1 on a last minute penalty kick scored by Carlos Hermosillo. This is still (2015) the quickest that a Primera División club has won eight championships, achieving the feat within 33 years of entering the Primera División. In 2001, Cruz Azul was invited to a tournament between select Mexican and Venezuelan teams that would then compete in the Copa Libertadores, a tournament of the best South American teams. The two best teams of this qualifying tournament earned immediate placement on the roster. Cruz Azul was one of the seeded teams and reached the 2001 Copa Libertadores final match. Cruz Azul started the tournament in Group 7 along with teams such as Sao Caetano, Defensor Sporting, and Olmedo. Cruz Azul finished as leader of the group with 13 points. In the round of 16 Cruz Azul faced Cerro Porteño. The first leg was played in Asunción and Cruz Azul lost 2–1. The second leg was played in Mexico and Cruz Azul won the game 3–1. The aggregate score was 4–3 in favor of Cruz Azul and they moved on to the quarterfinals. In the quarterfinals Cruz Azul faced CA River Plate of Argentina. The first leg of the match was played in Buenos Aires and ended in a 0–0 draw. The second leg was played in Mexico and Cruz Azul won 3–0. Cruz Azul was having a great run and played Rosario Central in the semifinals. The first leg was played in Mexico and Cruz Azul won the game 2–0. The second leg was played in Rosario in a very exciting match which ended in a 3–3 draw in favor of Cruz Azul due to the 2–0 victory in the first leg. Cruz Azul in the final match played against the Argentinian club Boca Juniors, Cruz Azul lost at home the first leg 1–0, but came back to win the second leg with the same score, at Boca's La Bombonera stadium with Paco Palencia scoring the goal. Until then, no team had ever won a Copa Libertadores final match there. After the overtime due to the tie, the championship was decided by penalty kicks, where the more experienced Boca Juniors prevailed. Still, Cruz Azul surprised everybody with the unprecedented feat of reaching the final and defeating established Argentinian teams such as Rosario Central and CA River Plate. In the 2006 Apertura, the team started off great but in the middle of the season, they had a hard time adding points on the board. Cruz Azul recovered and finished the regular season as the points leader. They have not won a title since the championship they won against Leon in 1997. For the Apertura 2006, Cruz Azul made it to the quarterfinals and faced Chivas in the Estadio Jalisco. In the first leg, Cruz Azul played a very poor game and lost 2–0. On November 25, 2006 Cruz Azul played the second leg at Estadio Azul and played a brilliant game. Cruz Azul started off strong and put Chivas keeper Oswaldo Sánchez to the test on many occasions. In the middle of the first half, defender Salvador Carmona pushed a Chivas player in the penalty area and cost Cruz Azul a penalty.Ramón Morales had no problem and put the score 1–0 in favor of Chivas in the 39th minute. Cruz Azul kept creating opportunities and at the end of the first half, César Delgado made a great play that Richard Núñez finished with a goal to tie the game right before halftime in the 45th minute. In the second half, Chivas scored thanks to Ramón Morales again to put the score 2–1 in favor of Chivas. Cruz Azul did not give up and Miguel Sabah tied the game 2–2 in the 62nd minute. Cruz Azul played a great game and ended up tying the game 2–2 but losing 4–2 on aggregate. In the 2007 Clausura the team had a great start, finishing among the first 8 teams in the league that went to playoffs. The team had a great quarterfinal series against the Tecos of the Universidad Autónoma de Guadalajara, thanks to two magnificent goals from striker Richard Núñez and moved to semifinals against Pachuca FC, the top team in the league. Pachuca beat Cruz Azul in the Estadio Azul in the first leg of the series with a strong 3–1. Cruz Azul still had a chance to overcome the adverse score, but on that same evening, the Court of Arbitration for Sport communicated that team captain Salvador Carmona was declared ineligible with immediate and lifetime effect, because of a repeated doping indiscipline that occurred back in January 2006. The sanction was dated May 18, 2007, the very day of the first match against Pachuca. Arguing that player Salvador Carmona did play on that day for Cruz Azul, the Mexican Football Federation, aka Federacion Mexicana de Futbol sanctioned Cruz Azul by suspending the team one game from competition, under the argument of aligning an ineligible player. Many legal arguments have been raised by both the player's lawyer and Cruz Azul, but the sanction stood and Cruz Azul lost its opportunity to overcome the 3–1 and go to the final series against America. Cruz Azul had one of the best seasons of their victory against Mexiel. In the Clausura the team played a great tournament, finishing in second place. The team won 9 games, had 4 draws and lost only 4 times. In quarterfinals they played against Jaguares losing 1–0 in the first leg and winning 2–1 in the second leg with goals of Pablo Zeballos and Miguel Sabah. They moved to semifinals against San Luis, the first leg was played in San Luis and Cruz Azul won 0–1 with a goal of Miguel Sabah. In the second leg, Cruz Azul and San Luis played a formidable match that ended 1–1 with goals of Eduardo Coudet and Pablo Zeballos. In the final, Cruz Azul played against Santos Laguna, second place in the tournament. The first leg ended 1–2 with a victory for Santos, and in the second leg a 1–1 make Laguna team champions. In the Apertura the team had a good tournament, finishing in 5th place on the Mexican league. The team won 7 games, drew 5 times and lost only 5 times. In the quarterfinals they played against Pumas UNAM with a 0–0 scoreline in the first leg in the "Estadio Azul", and won 3–1 in the second leg, in the "Estadio Olímpico Universitario 1968" leaving Pumas on the way. They moved to semifinals against Atlante, the first leg was played in Mexico City, and Cruz Azul won 3–1. In the second leg, Cruz Azul and Atlante played a regular match in Cancún, Quintana Roo, that ended 1–1, resulting in Cruz Azul reaching the Final for the second consecutive time in 2008. In the final, Cruz Azul played against Toluca, both teams tied on winning Mexican titles (at that time with 8 each). The first leg played in Mexico City, and ended with a dramatic 0–2 with a victory for visitors, Toluca, and in the second leg, which was played at "Estadio Nemesio Díez". Cruz Azul won 0–2, making the tie on aggregate "2–2", as the match was tied, they played "extra time" and the draw continued until going to the "Penalty – Shoot out", where Toluca won 7–6 over Cruz Azul, Alejandro Vela was the Cruz Azul "villain" because he failed the last "penalty shoot-out", another incident before the match went to "extra time", was a clear foul suffered by Villaluz on the Goal area, the toluca player "Jose Manuel Cruz Alta" crashed with the Cruz Azul player, making him unconscious, but the referee didn't mark the foul even though the Cruz Azul player was knocked out, he didn't even take a red card on the toluca player, (unfortunately Cruz Azul had made his 3 substitutions, so they ended the match playing with only 10 players, an unfair situation, that interfered directly on the final result of the match) this made the Toluca team becoming champions winning their 9th Mexican title, becoming the 3rd most successful of Mexican title winning teams. (1.-America "12 titles", 2 . Guadalajara "11 titles", 3.-Toluca "10 titles", 4.-Cruz Azul "8 titles", .- Pumas UNAM "6 titles", 6.- Club León 7 titles, Club Pachuca "5 titles"). In the Clausura 2009, the team had the worst tournament in club history en route to a last place finish. They accumulated just 13 points from a possible 51 (17 games, wins count 3 points). The team won only 2 games, drew 7 times and lost 8 times. The Club scored 26 goals, but conceded 33, for a total goal difference of −7. The Club did not qualify for the playoffs, or Liguilla. The Club sacked their manager Benjamín Galindo with one game left in the Clausura. He was replaced for the remainder of the season by Robert Siboldi who was then coaching Cruz Azul's affiliate in Hidalgo. Cruz Azul beat UNAM 5–0. On the CONCACAF Champions League 08/09, The team made a good tournament, on the first stage ended second on the Group A, qualifying to the final stage of playoffs, defeating on the quarter finals, the Mexican team of Pumas UNAM, by 2–0, and the on the semi final round, the played against the Puerto Rico team of Islanders, by "penalty shoot-out" at Mexico City, On the Final, against another Mexican Team, Atlante, they had the chance to win their 6th CONCACAF championship, but they lost the first game 0–2, then on Atlante's home they tied 0–0, losing the CONCACAF Champions League 08/09 Title, and also losing the opportunity to participate on the FIFA World Club Cup 2009, on Abu-Dhabi, UAE. In the Apertura 2009, the team had signed Javier Cambranis, to manage the team, and signed several players, such as the best goalkeeper on the previous Mexican tournament, Jose de Jesus Corona, the Derby County Striker, Emanuel "Tito" Villa, Ramon Nuñez, Emilio Hernandez, and the team successfully ended on the second place of the regular season, they made 33 points out of 51 possibles, winning 11 games of 17 played, without any game tied, and 6 games lost, they scored a total of 35 goals, and received only 19, for a goal difference of +16, and Emanuel "Tito" Villa, was the top scorer of the tournament with 17 goals, the team qualified for the playoffs, and played against Puebla F.C. on the quarter-finals, they beat Puebla (first game 4–4, second game 3–2), and on the semi-final leg, they played against Monarcas Morelia, and they won (first game 0–0, second 2–1), and went to the final, once again, for the third consecutive time in 4 tournaments, they faced Monterrey FC, but they lost the final (on the first game 3–4, and 1–2 on the second), and once again the team lost another final, remaining with just 8 league titles and 8 finals lost, making the Cruz Azul Team, the only one who has played 16 finals on Mexican Tournament, but lost half (8). In April 2012, Cruz Azul changed their official name from Club Deportivo, Social y Cultural Cruz Azul, A.C. to simply Cruz Azul Futbol Club, A.C. In the 2009–10 CONCACAF Champions League, the team had a good tournament, finishing first in Group C and qualifying for the final stage of playoffs. In the quarterfinals, they defeated the Panamanian team of Árabe Unido, by 4–0, and then in the semifinal round, the played against the Mexican team of Universidad Nacional, by 5–1 at Mexico City. 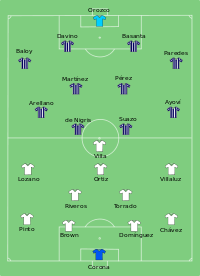 In the Final, against another Mexican club, C. F. Pachuca, they had the chance to win their 6th CONCACAF championship, winning the first game 2–1, but losing in Pachuca's home at the last minute 1–0 by the away goals rule, thus losing the opportunity to participate on the 2010 FIFA Club World Cup in the UAE. During the 2013 season Cruz Azul showed a slow start with questioning over Memo Vazquez possible sacking. Cruz Azul regained confidence after beating Club America in Copa MX semi finals and winning Copa MX final vs. Atlante. After Cruz Azul won the Copa MX their Liga MX performance improved and they were considered one of the contenders for the title due to a good streak. They would face bitter rivals Club America in what would be a historical final series of the "Clásico Joven." Cruz Azul dominated the series in terms of score from minute 19 of the first leg up until minute 89 of the second leg. Cruz Azul was up 2–0 in aggregate when Club America made a miraculous comeback in the minute 89 and 93 of the second leg. Club America would go on to win in PK's. On April 23, 2014 after defeating Toluca, Cruz Azul won their 6th CONCACAF championship which was a record at the time. This gave Cruz Azul a berth at the 2014 FIFA Club World Cup where they would earn a 4th-place finish. Since the Apertura 2014, Cruz Azul has been unable to qualify to the liguilla playoffs for 6 consecutive tournaments. Cruz Azul qualified for the liguilla, for the first time in three years, in the Apertura 2017 season. However, they were eliminated in the quarterfinals by América, who advanced as the higher ranked seed, with an aggregate score of 0–0. On 27 November 2017, Cruz Azul announced that Paco Jémez would not renew his contract for the following season. In the Liga MX Clausura 2018 tournament, Cruz Azul ended up ranked 12th and failed to qualify for the liguilla. Cruz Azul were last place in the group stage of the Clausura 2018 Copa MX. On 7 May 2018, the club announced director of football Eduardo de la Torre's contract had ended and would be replaced by Ricardo Peláez, former director of football for América. Cruz Azul televised matches for several years were on TV Azteca in Mexico (Azteca America in the United States), but in the fall of 2013 they moved to Televisa in Mexico (Univision in the U.S.). On 31 October, they would face Monterrey in the Apertura 2018 Copa MX Final, winning 2–0 with goals from Elías Hernández and Martín Cauteruccio. It was their first trophy in the tournament since 2013. Cruz Azul faced Club América in a rematch of the Clausura 2013 final for the Apertura 2018 final. The first leg was played on 13 December 2018 which ended in a scoreless draw. The second leg was played on 16 December 2018 and ended in a 2-0 victory for Club América. With this defeat Cruz Azul extended its 21-year-old championship drought in the league for at least another season. For further information, see Category:Cruz Azul footballers. 1962–66 Jorge Marik First coach of Cruz Azul in Primera División. July 1, 1992 – Jan 29, 1995 Enrique Meza Second tenure at the club. 1995–96 Luis Fernando Tena Won 1996 CONCACAF Champions' Cup. July 1, 1996 – March 9, 1997 Víctor Manuel Vucetich Won the second Mexican Cup tournament for Cruz Azul. 1997–2000 Luis Fernando Tena Won Cruz Azul's eighth title, against León, and the 1997 CONCACAF Champions' Cup. Lost a final against Pachuca in 1999. March 31, 2000 – Dec 31, 2002 José Luis Trejo Led Cruz Azul to the Copa Libertadores final in 2001. Sept 27, 2005 – Dec 31, 2005 Rubén Omar Romano Kidnapped and held hostage for 65 days during his tenure. July 1, 2007 – June 30, 2008 Sergio Markarián Led Cruz Azul to a final after nearly 10 years, lost against Santos Laguna. July 1, 2008 – June 30, 2009 Benjamín Galindo Lost 2 finals with Cruz Azul, (Vs. Toluca in the Mexican Tournament, and Vs. Atlante in the Final Concacaf Champions League). July 1, 2009 – June 30, 2012 Enrique Meza Led the team to another Mexican Tournament Final, but lost against Monterrey, and a Final Concacaf against Pachuca. July 1, 2012 – December 3, 2013 Guillermo Vázquez Won the third Mexican Cup tournament for Cruz Azul. November 28, 2016 – November 27, 2017 Paco Jémez Led Cruz Azul to first liguilla appearance since Clausura 2014 in the Apertura 2017 season. December 5, 2017 – Present Pedro Caixinha Won Apertura 2018 Copa MX and led Cruz Azul to first league final since Clausura 2013. The club's crest has stayed relatively consistent since its foundation in the 1920s, with a blue cross in a white circle surrounded by a red square, with the club's name above and below. As years went by and titles were won, the crest was modified to proclaim Cruz Azul's achievements, adding a larger blue circle/frame after the 1971–72 season showing three stars for each Liga MX championship win (showing eight stars since the end of the 1997 season). Cementeros (cement workers): As a result of affiliation with Cruz Azul Cement, the first name refers directly to the employees of the company, as the team originally was formed with them. Over the years, the concept is extended not only to those who worked in the cooperative, but the construction workers in general. Liebres (hares): When the team was promoted to the Primera División in the mid-1960s, the club played a fast and physical game. These characteristics, coupled with their mostly white uniforms, led fans to compare the players of those years with the hares which abound in the town. The nickname took hold, and an anthropomorphic hare is often used as a mascot and icon to represent Cruz Azul. While some modern fans believe that the mascot is a rabbit, the club's board has officially declared that it is a hare. La Máquina (the machine, the locomotive): This nickname is fed by several sources of inspiration. One is based on a railway that brought the cement from the Cruz Azul plant, in the former village of Jasso (south of Tula de Allende), to Mexico City. After moving to Mexico City, Cruz Azul was the most dominant club in Mexico during the 1970s, reinforcing the nickname as a comparison to the image of a locomotive sweeping through their opponents. The name may have been borrowed from the similarly nicknamed River Plate club that motored through its opponents in the Argentine Primera División in the 1940s. It has been suggested that reporter Rugama Angel Fernandez was the first to publish an article with the name La Máquina for Cruz Azul. The nickname has some variations, including The Celestial Machine, The Blue Machine and The Cement Machine. Since its inception, the team had supporters, mainly workers of the cement. After promotion to the Primera División in the 1960s, more people began to follow the team. In the 1970s when the team managed six of their eight titles even more people joined the group of supporters of the team, until now that in this 21st century according to various surveys[which?] is the third team with the most supporters in Mexico, behind the Club Guadalajara and América respectively, above the club UNAM. Main Rivalry: the "Clásico Joven" vs. Club América. Cruz Azul has the distinction of being the only Mexican football club to win the North American treble – winning the League, Mexican, and North American championships in 1997. Along with Club America, It is the Mexican club with the most titles at international level (6 titles in the Copa de Campeones de CONCACAF, plus a runner-Inter's Cup in 1972 and another in the Copa Libertadores de America in 2001). Along with Club America, Mexican Club with most titles in the Copa de Campeones de CONCACAF, with 6. Holds the record for most consecutive wins in the history of the Primera División: 10 wins in the 1971–72 season. It is the only team that thrashed in the final's América to win the league title (4 goals to 1) in the 1971–1972 season. 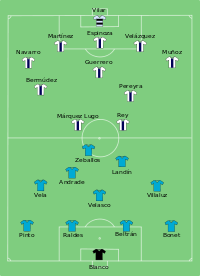 It is one of the three teams in the history of the Primera División have been three-time league (succeeding in 1971–1972,1972–1973 and 1973–1974), the other two teams are América who did a decade later and the Club Deportivo Guadalajara. It is the youngest team to be champions and cup, reached only five years after his rise in the 1968–1969 season. The national tournament: 8–2 vs. Toros Neza (1993–94). The national tournament: 0–5 against América (1981–82). 19 (round 18 from semifinal round of (1973–74). In long tournaments: 91 (1994–95). The team currently plays in the Estadio Azteca in Mexico City. Cruz Azul's training facilities are named "La Noria", which are located in Xochimilco. The team returned to the Estadio Azteca in the Apertura 2018 season after spending 22 years at Estadio Azul, which has been slated to be demolished. The team has indicated that it intends to build a new stadium, but solid plans such as location have not materialized. Horacio López Salgado 25 Goals in "1974–75"
Carlos Hermosillo 28 Goals in "1993–94"
Carlos Hermosillo 35 Goals in "1994–95"
Carlos Hermosillo 26 Goals in "1995–96"
^ "World Club Ranking 2014". International Federation of Football History & Statistics. 2015-01-13. Retrieved 2015-03-25. ^ "Esmas.com". Esmas.com. 2008-02-12. Retrieved 2012-01-10. ^ "Cruz-azul.com.mx". Cruz-azul.com.mx. Archived from the original on 2012-03-01. Retrieved 2012-01-10. ^ "Jémez no renovará para el Clausura 2018" [Jémez will not renew for the Clausura 2018] (in Spanish). 27 November 2017. Retrieved 27 November 2017. ^ "Paco Jémez deja de ser técnico de Cruz Azul" [Paco Jémez is no longer the coach of Cruz Azul] (in Spanish). 27 November 2017. Retrieved 27 November 2017. ^ "Termina la relación laboral con Eduardo de La Torre" [End of working relationship with Eduardo de La Torre] (in Spanish). 7 May 2018. Retrieved 13 May 2018. ^ "Bienvenido Ricardo Peláez Linares" [Welcome Ricardo Peláez Linares] (in Spanish). 7 May 2018. Retrieved 13 May 2018. ^ "Peláez llega a Cruz Azul con deseo de ser campeón" [Peláez arrives at Cruz Azul with the hope to become champion]. 9 May 2018. Retrieved 13 May 2018. ^ "Los retos de Ricardo Peláez en Cruz Azul" [The challenges for Ricardo Peláez at Cruz Azul] (in Spanish). 8 May 2018. Retrieved 13 May 2018. ^ Arnold, Jon (1 November 2018). "Cruz Azul beats Monterrey to lift Copa MX". Goal. Retrieved 2 November 2018. ^ "Lista de jugadores registrados en el equipo Cruz Azul de primera división profesional". Cruz Azul FC. Retrieved 19 June 2018. ^ "Cruz Azul crest history". Maquina-azul.com. Archived from the original on 2012-03-11. Retrieved 2012-01-10. ^ "Cruz Azul Futbol Club - Honor y Lealtad a Nuestra Patria, Valor y Nobleza en el Deporte". cruzazulfc.com. Retrieved 4 January 2017. Wikimedia Commons has media related to CD Cruz Azul. This page was last edited on 24 April 2019, at 11:14 (UTC).